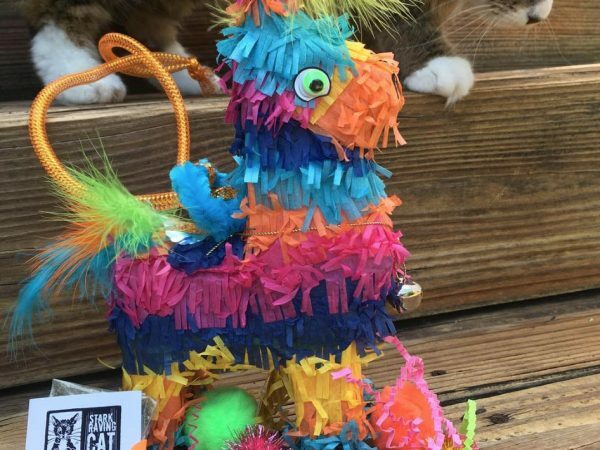 A real mini-piñata filled with catnip cat toys! 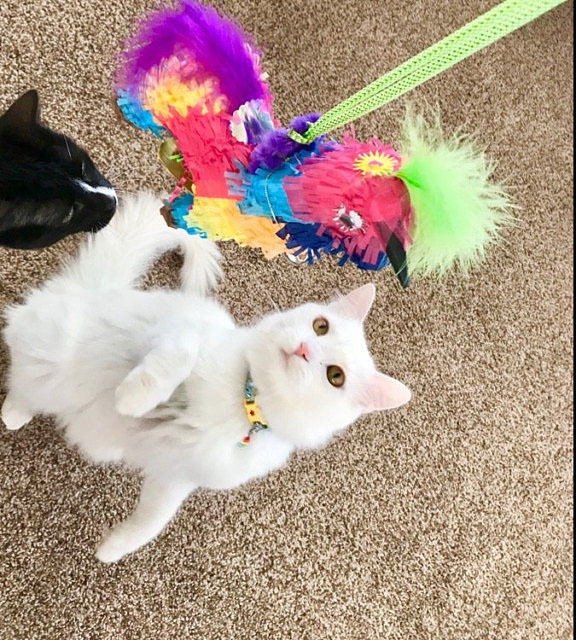 Open the trap door, swing it from the cord, and let the goodies fall out – instant fiesta for cats! 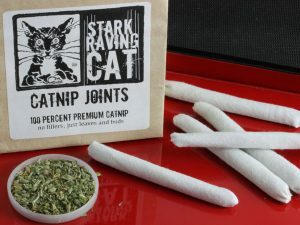 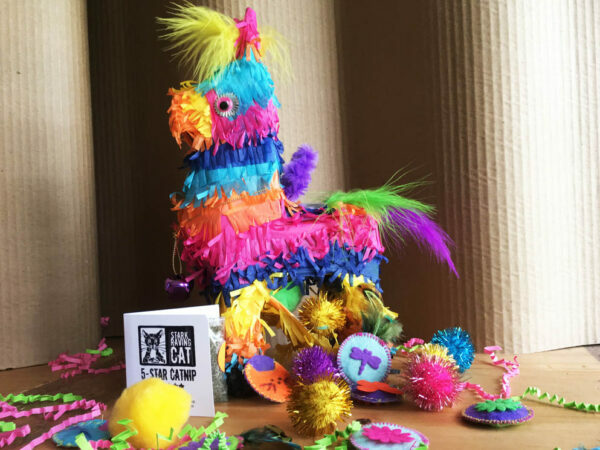 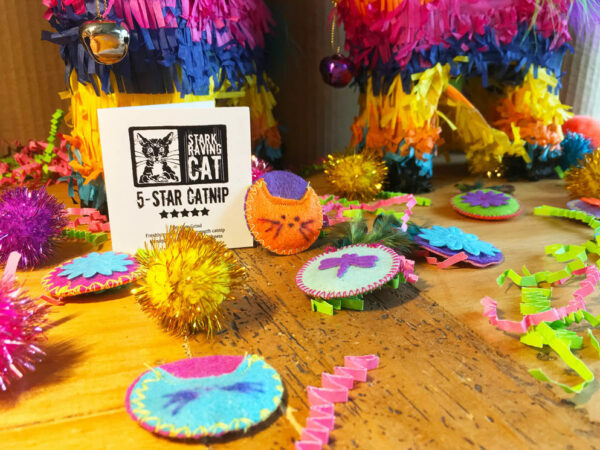 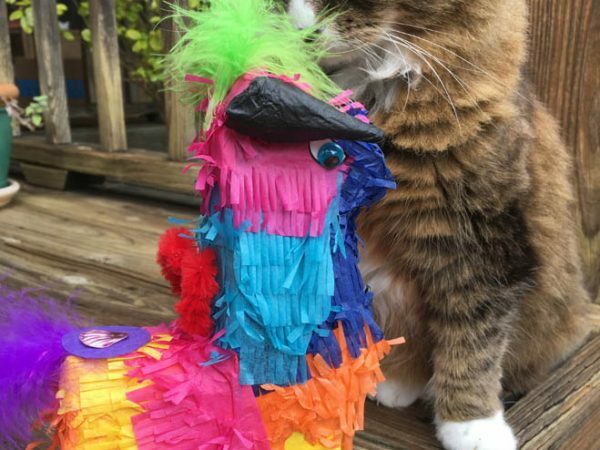 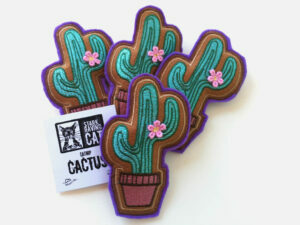 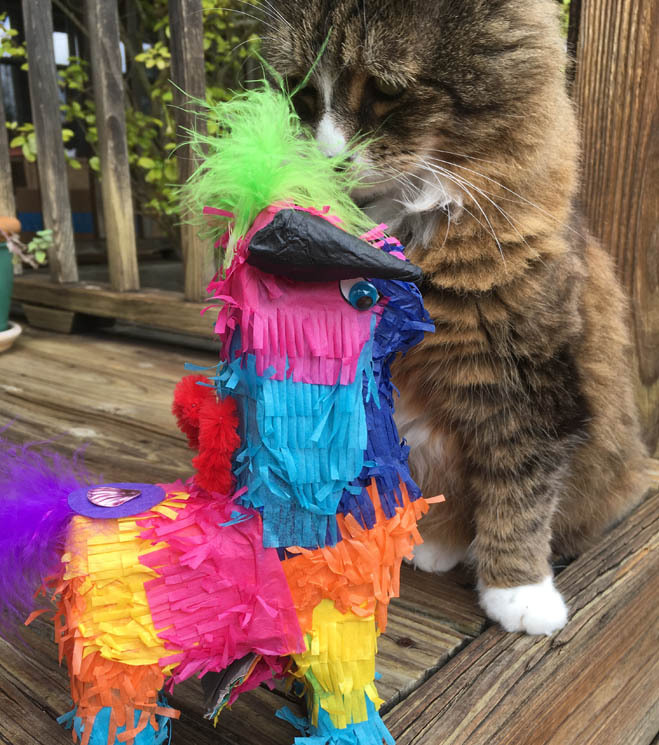 Stark Raving Cat’s piñata comes with soft playthings – pompoms, crinkle shreds, handmade catnip “coins,” and our adorable Itty Bitty Catnip Kitties. 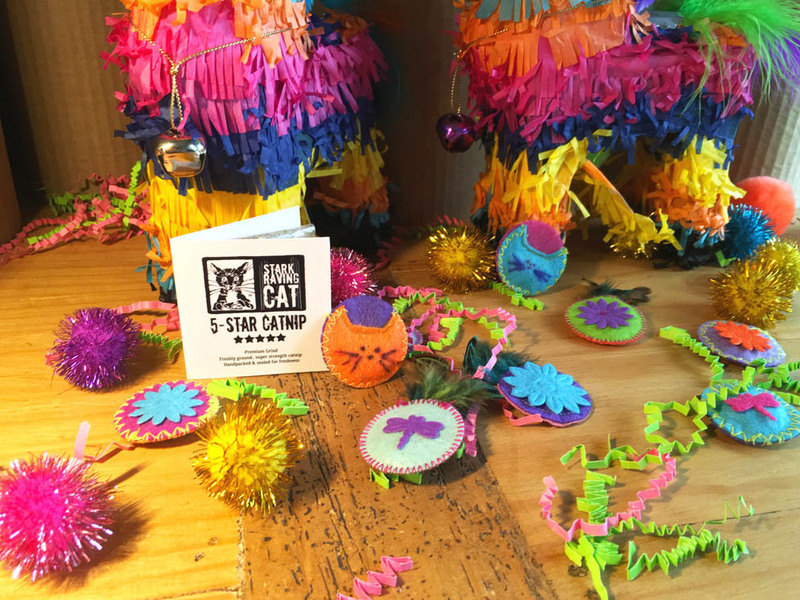 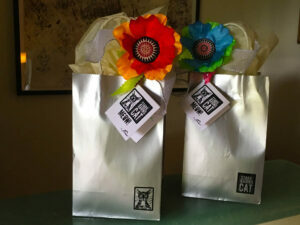 PLUS: a bonus packet of our potent 5-Star Catnip (toss the pompoms in the catnip to make the pawty even more fun). 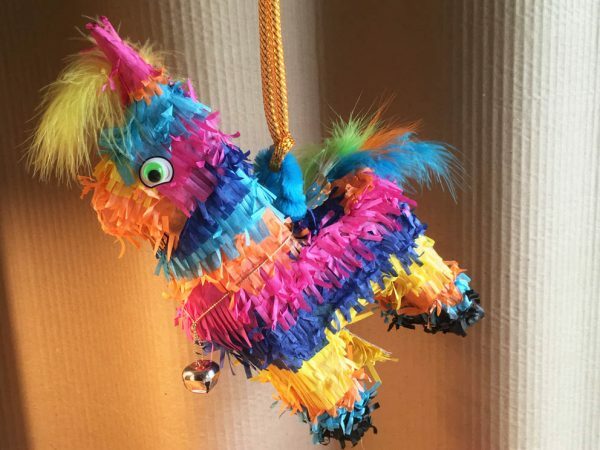 Choose between a Donkey (Burro) or a Bull. 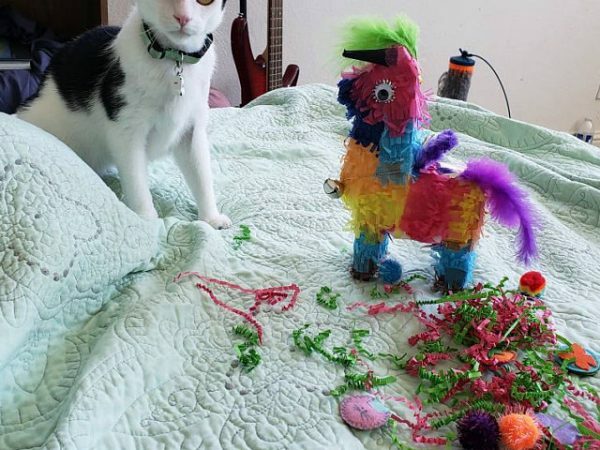 They look similar but the bull has paper horns. 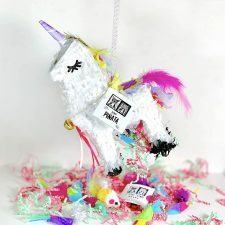 OR check out our Unicorn Piñatas. 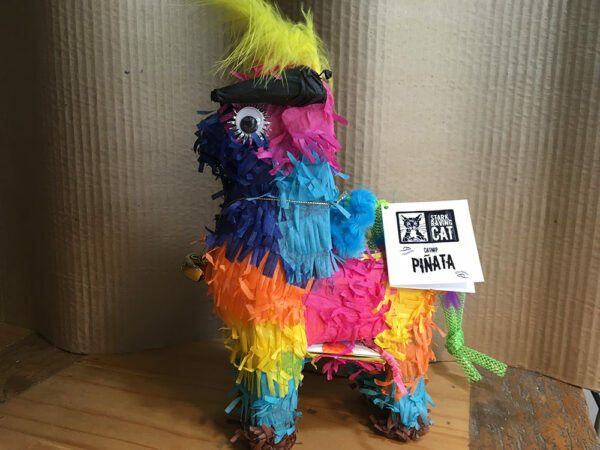 Piñatas are traditional used to celebrate birthdays and Cinco de Mayo. Cinco de Mayo, originally a Mexican holiday, has become a celebration of Mexican-American culture, observed on May 5th. 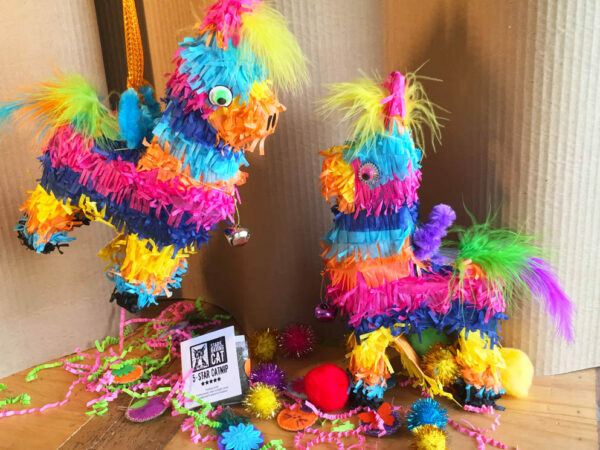 Piñatas are meant to be destroyed – it’s part of the fun. 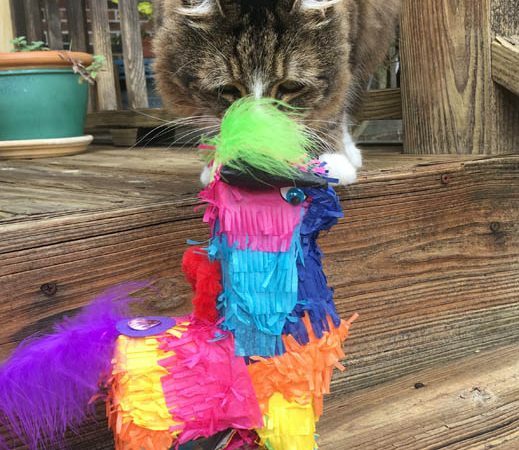 But if you’re careful, you can reuse this cute burrito again and again: swing the piñata just out of paw’s reach, and let the cats dive for the falling toys. 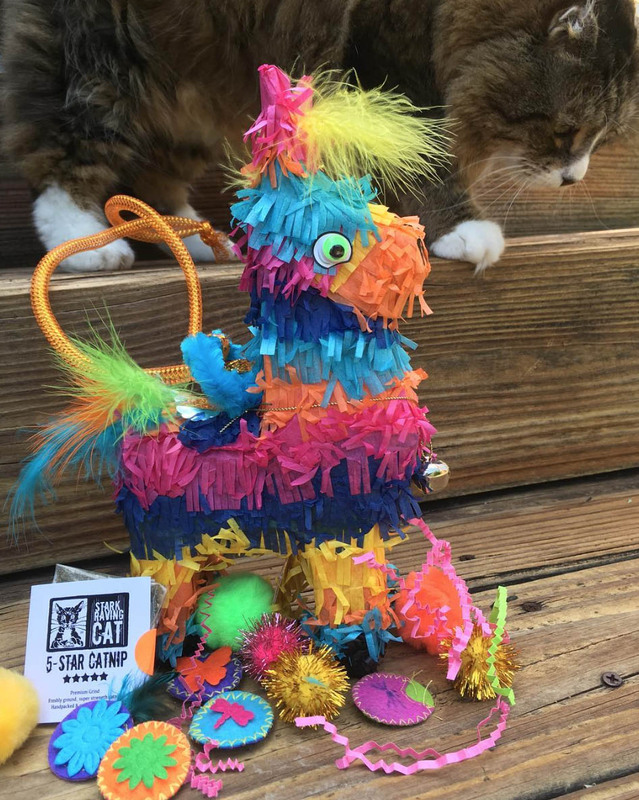 Stark Raving Cat’s piñata makeover features: A big, shiny bell that jingles when shaken; bright feathers on crown and tail; googly eyes; a bouncy cord and loop; a shiny “silver saddle,” and a teensy cat cut-out. 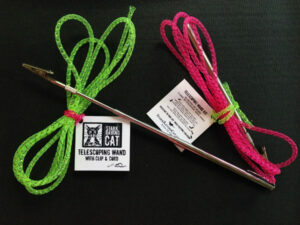 A trap door on bottom lets the toys fall through – all soft items: nothing hard to bop a cat’s nose. 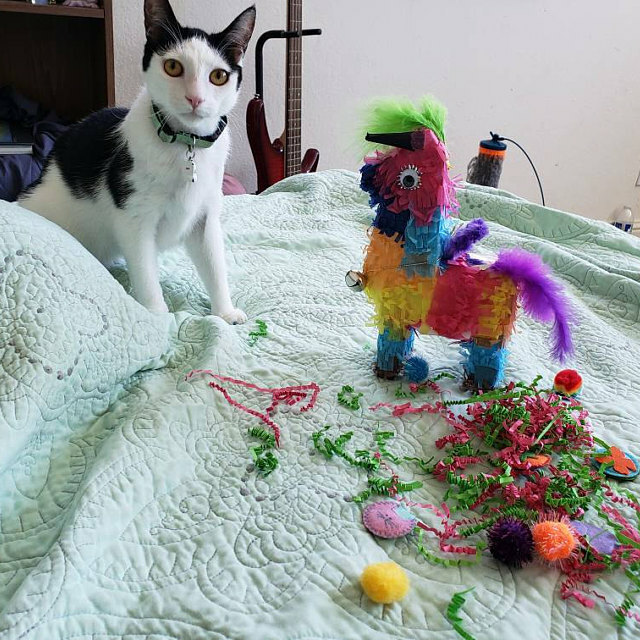 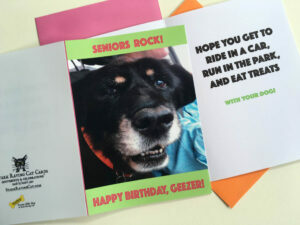 And for extra excitement: colorful, crinkly paper shreds. 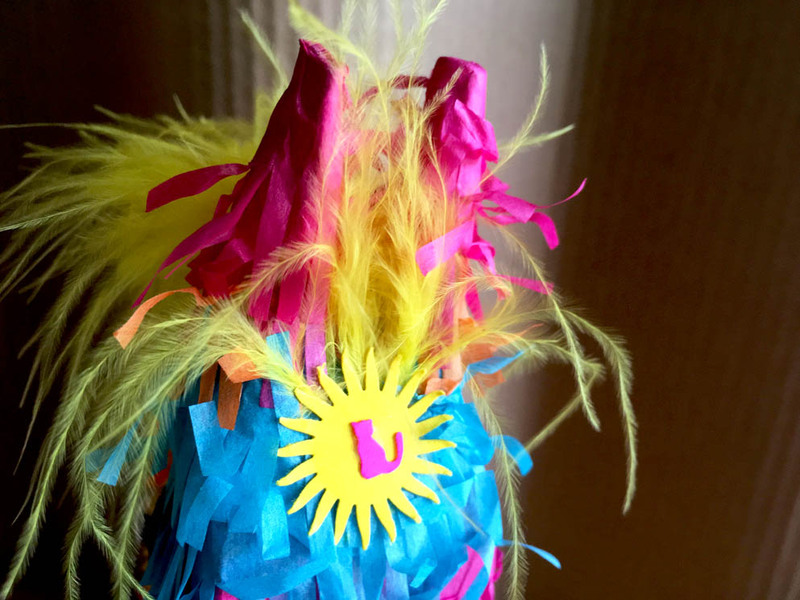 Note: Each piñata is handmade; expect variations in embellishments, colors and feathers. 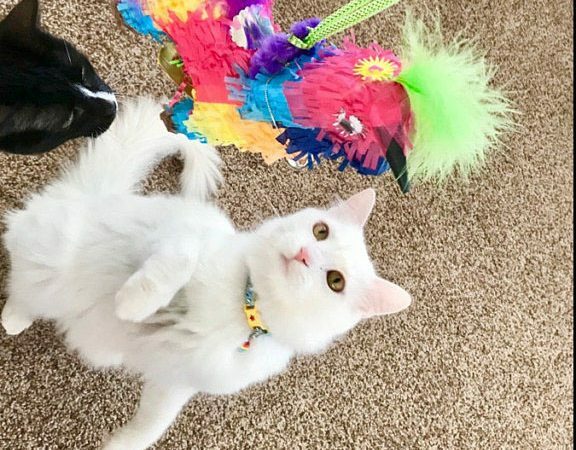 Like snowflakes (and cat personalities), no two are exactly alike. 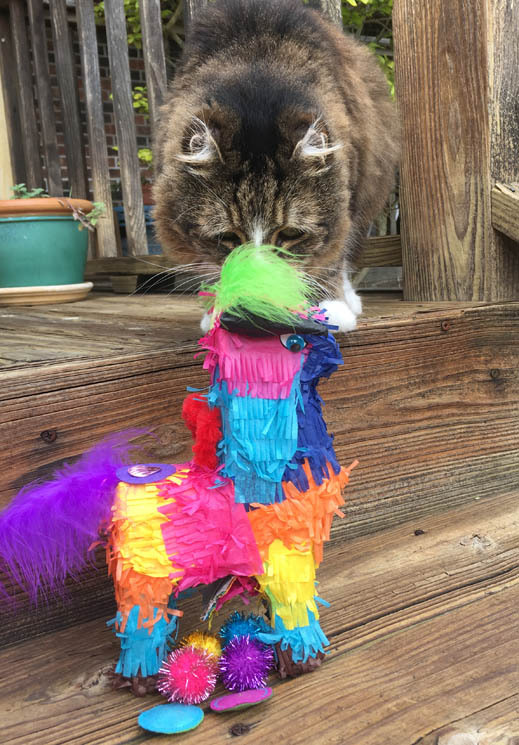 But all are fun and festive – and unique. SHIPPING: Piñatas take some time to craft. 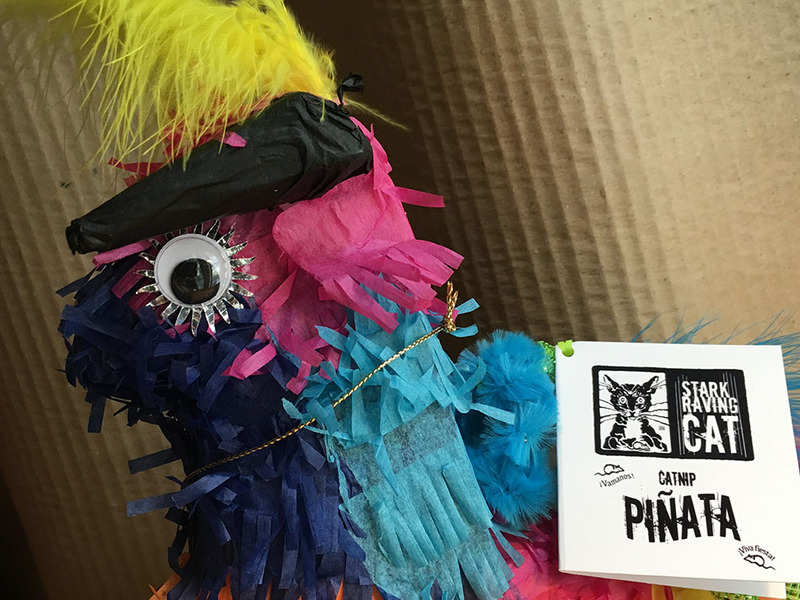 Please allow an extra 1-2 days over our normal processing time for Piñatas to ship.